Stanhope necklaces are beautiful pieces of jewelry at first glance, but it is the subtle microphotographs inside each piece that truly makes them special. Any piece from our Stanhope necklace sets give you the ability to choose the necklace you like, then customize with a photo or image which will be visible in the piece’s peephole. These beautiful necklaces come in your choice of Opal, Jade, Onyx, and many other gemstone and gemstone combinations. Do you have a favorite photo or even a prayer? The Stanhope necklace sets are perfect to always keep something special to you close. Some pieces allow you to choose from our selection of photos and prayers, while some even allow you to use our easy process of uploading your favorite image right from your computer. The microscopic images inside the necklaces are magnified over 160 times by the hand-crafted lens, creating a crystal clear view without a microscope! 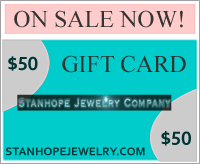 These Stanhope necklaces are great gift ideas since the recipient will undoubtedly love the extra surprise when they take a look inside the peephole and see the image you have chosen. Give them a special message, remind them of a favorite memory with the perfect photo, the unique ideas are endless! Whether it’s one of our unique cross designs or a pendant, the Stanhope necklaces will be the most unique piece in your collection. These necklaces will allow you to keep a loved one or favorite memory close to you and in beautiful fashion. If you love crosses, our wide selection of cross necklaces will be the most unique in your collection as you can use a text image of your favorite prayer for the image inside the cross. The unique design and quality craftsmanship of these necklaces make them keepsakes that you will undoubtedly treasure for a lifetime. Choose your favorite Stanhope necklace today, customize the photo inside the peep, and enjoy free shipping on your necklace order!